The Middle Helladic (MH) period starts around 2100 BC or earlier with a severe crisis, which sees the depopulation and destruction in various sites, changes in material culture, burial rite and settlement pattern, hierarchy, and space. Traditionally, these changes have been explained as the consequence of migrations—or at least infiltrations—of ethnic groups probably from the north. Many sites are destroyed or abandoned between 2350 and 2100 BC, and the number of sites in use decreases dramatically. Trade relations are broken, inferred from the lack of circulation of ceramics and chipped stone (Voutsaki 2010). Especially rural sites are affected, with a decrease in size of the existing settlements and disappearance of site hierarchy. Some sites retain a considerable size, such as Thebes, Argos, or Mycenae. In this new period, few settlements are fortified. Houses are self-standing and positioned in an irregular fashion, with stone foundations and mud-brick superstructure, with ca. 50–60 m2. In the following period (ca. 2100–1700 BC) recovery in different regions is seen at different pace, with resettlement of areas and increase in size of the old sites, larger or more complex domestic structures appear, and some accumulation of wealth (Voutsaki 2010). Slight changes can be seen in burial rite in the early period (ca. 2100–1700 BC), with burials being intramural, and tumuli found with an uneven distribution. There is evidence that tumuli are also places of cult rites. Extramural cemeteries appear later (especially ca. 1900 BC onwards). Grave types include simple pits, cists of various types, and large pithoi, with single, contracted inhumations and rarely offerings. Later, extramural cemeteries become widespread, new tomb types are used (shaft grave, tholos tomb, chamber tomb) and reuse of the grave and secondary treatment of the body become common. This time coincides with the appearance of shrines, at the end of the Middle Helladic period (Voutsaki 2010). Changes in material culture include the appearance of apsidal buildings, terracotta ‘anchors’, stone shaft–hole hammer–axes, and tumuli, which point to the influence of northern migrants. Arsenic copper is replaced with bronze metallurgy, and the potter’s wheel is adopted. Toward the end of the period (from ca. 1700 BC), the mainland sees an intensification of exchanges within and beyond the Aegean, with diversification of pottery styles and technologies, including Cycladic and Minoan influences, the appearance of a uniform ceramic style, the adoption of figurative elements, and the import of valuable objects (Voutsaki 2010). New trade contacts appeared soon after ca. 2100 BC between the eastern coast and the Aegean islands, with fluctuating small-scale overlapping networks. Contacts with Epirus and Macedonia included Minyan imports and local imitations, probably related to the newcomers, found also in a few coastal sites. The Adriatic inner and coastal trade was irregular, with some communities or social groups showing more success than others in the different periods. Most of the copper and all of the lead used come from the Aegean, although some may have come from the Aegean Islands, Cyprus, or Rodopi in Thrace (Voutsaki 2010). The MH society was organised in villages with a subsistence economy based on agriculture and animal husbandry, and limited craft specialisation. This is in contrast to the Aegean Islands, where pottery production was highly organised. The existence of elites is evidenced by the presence of few rich tombs in the early period (ca. 2100–1700 BC), whose rarity may point to different forms of social organisation in the mainland, until the appearance of Shaft Grave elites at the end of the MH period. There is a subtle increase in the complexity of mortuary practices. More radical changes take place after ca. 1700 BC (Voutsaki 2010). The Middle Minoan period features the appearance of the ‘First’ or ‘Old’ palaces (ca. 1900 BC or earlier) in several sites on Crete, probably as an evolution of similar structures with a central court and storage facilities. They represent both the residence of the elite and probably regional redistributive centres linked to an agricultural hinterland, akin to the redistributive temple economy of the Near East, as evidenced by the administrative nature of Linear B tablets. The emergence of similar buildings through Crete point to a hierarchical society. Minoan palaces were probably also minor production centres (e.g. textiles) and concentrated high-status objects, as well as agricultural commodities. Writing and sealing practices are also traditionally associated with the emergence of the palaces (Schoep 2010). The Mycenaean Civilisation (ca. 1700–1100 BC) begins during the late phase of the Middle Helladic period, as a unifying process of the material culture, boosted by the competitive interaction of mainland elites, based on hunting and military prowess, access to external materials, and control of the trade of the mainland with Minoan Crete and the Cyclades, as these cultures intensified contacts (Shelton 2010). 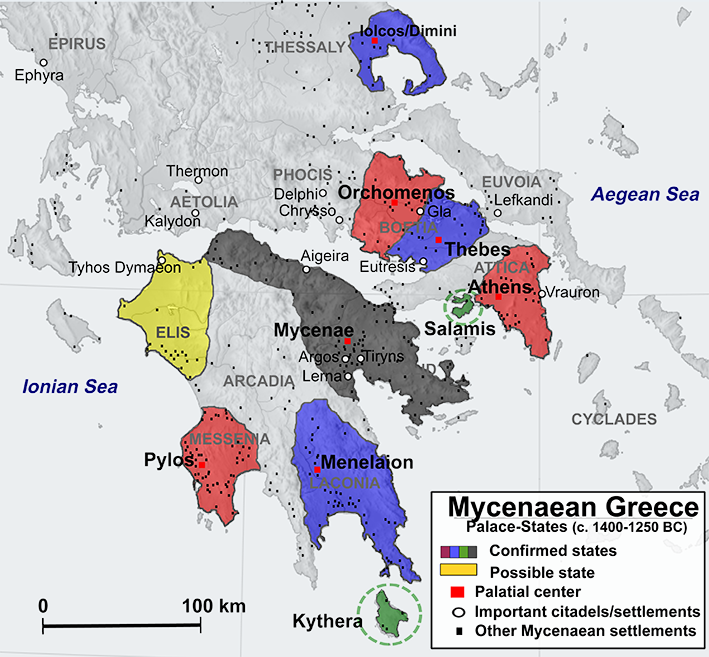 The Early Mycenaean period (ca. 1600–1400 BC) features the first tombs displaying power, wealth, and warfare (such as the Shaft Graves of Mycenae), with pottery, burial customs, and weapons indicating cultural continuity, and thus emerging elites within the previous community. Cemeteries are well defined, organised and divided, and settlements are small, possibly organised into functional or social divisions. Individual regions develop independently, probably under individual chiefs or alliances of chiefs, although common uniform trends are also seen (Shelton 2010). The palatial system saw a complete stratification of society, with independent settlements gradually consolidated into competing polities organised around larger sites, represented by strong families or chiefs as evidenced by tholoi. Contacts with Minoan palaces was essential for wealth acquisition by Mycenaeans, marking political and social status. Mycenaean styles, arts and beliefs imitate those from Minoans, and it becomes difficult to distinguish them. During the Early Palatial period on the Greek mainland, destructions occur on Crete, and afterward Mycenaean control clearly expands in the southern Aegean, with a takeover of Minoan trade routes and depots. At the end of this period, mainland influence is seen on Crete (Shelton 2010). The Palatial period (ca. 1400–1200 BC) is marked by the evolution of many previously competing polities into centrally focused and administered states, with stabilisation of the social organisation and institutionalisation of power structures (Figure 70). This period shows an expansion of Mycenaean culture to the north into Mount Olympus, to the west into Epirus, and to the east into the Dodecanese (Shelton 2010). Figure 70. Reconstruction of the political landscape in c. 1400–1250 BC mainland southern Greece, based on Kelder (2010). Image by Alexikoua. The economic success of Mycenaean palaces reached Asia Minor to the east, Macedonia to the north, Sardinia to the west, and the northern Aegean. Extensive building programs, engineering, and infrastructure support in citadels, palaces, and settlements a large but exclusive elite class and a substantial population at varying distances from the centre, with widespread systematic transportation and communication networks intra- and interregionally (Shelton 2010). Evidence from the clay tablets written in Linear B script show a power hierarchy with the wanaks (king) at the top, as well an administrative system with a power hierarchy, with many administrators being individual landowners, and where material and human resources are mobilised from the centre for the needs of the political economy. Homogeneous Mycenaean pottery (‘the Mycenaean koine’) appears over much of the Mediterranean, probably necessary for the trade of its content, especially oil and wine (Shelton 2010). The increasing centralised control was accompanied by localised destructions followed by rebuilding on a large scale. Around 1200 BC, growing isolated instances of destruction and decline and tightening of control gave way to the destruction of all palaces, which are not rebuilt. Many non-palatial sites are abandoned, and the administrative system disappears. Certain sites recover and prosper for a brief time, on a much smaller scale, and regional and local cultural traits develop. The population decreases, and after this small economic recovery, there is a more rapid economic decline in the 11th century BC (Shelton 2010). The expansion of the first waves of Proto-Greek speakers into the southern tip of the Balkan peninsula must have started at the end of the Early Helladic and beginning of the Middle Helladic period, possibly coinciding with the expanding Minyan pottery style (Beekes 2011), and with the appearance of horse breeding, millet-consuming cultures from the north or north-east, via river valleys leading to the Danube (Valamoti 2016). Mycenaean samples from the Peloponnese show a contribution of Steppe ancestry (ca. 20%), which can only be interpreted as the arrival of peoples from the north, although this ancestry is not found in one Mycenaean individual from Crete (Lazaridis et al. 2017). These investigated samples from the Peloponnese include: from the eastern site of Galatas Apatheia, one early individual (ca. 2900–1900 BC) in a primary pit–grave buried with two dog carcasses—connected to the social and ideological role of hunting in the Mycenaean society—suggesting that she was a distinguished member of the local community, and a later male (ca. 1700–1200 BC, with estimated range for pottery ca. 1500–1200 BC), of hg. J2a1d-M319, the same found previously among Minoans (see §vii.4. Aegeans and Anatolians); to the north of Apatheia, from Agia Kyriaki in Salamina (ca. 1340 BC), a large chamber tomb cemetery belonging to the chief Late Helladic cemetery of the island, corresponding to the Palatial and Post-Palatial periods; and from the western site of Peristeria Tryfilia (ca. 1350 BC), the “Mycenae of the Western Peloponnese”, an early Mycenaean settlement which may have served as a seat of a local ruler dynasty, flourished from the 17th to the end of the 13th century BC. The Late Minoan III Necropolis of Armenoi in Crete (ca. 1390–1190), with two hundred and thirty-two chamber tombs, and one thousand interred individuals, in a site with a stirrup jar with a Linear B inscription, has yielded one sample without detectable Steppe ancestry (Lazaridis et al. 2017). This individual suggests a variable introduction of Steppe ancestry into the different territories that Mycenaeans eventually controlled, and thus potentially the introduction of the language without much genetic change, similar to how southern Balkan J2a1d-M319 lineages may have been incorporated into the Proto-Greek community (at least partially) through exogamy, due to the high demographic density of the Aegean (Müller and Diachenko 2019). Analysis of modern Greek and Cretan lineages point to a Neolithic expansion of haplogroup R1b1a1b-M269 in the region, which was found nearer to Italian than to Balkan lineages (King et al. 2008). Analysis of Greek-Cypriot modern populations revealed the presence of R1b1a1b1b-Z2103 lineages in easternmost and westernmost sides of the island, with R1b1a1b1b3a1-Z2110 lineages appearing only in the east (Voskarides et al. 2016). The early attestation of Mycenaean Greek in the island points to an early expansion of R1b1a1b1b3a1-Z2110 lineages. Most R1b1a1b-M269 lineages in Greece are probably linked to the Bronze Age expansion associated with the Minyan pottery, in turn linked to an earlier Yamna expansion into south-eastern Europe. Most R1a1a1-M417 lineages, whose proportion in Greece and in historically Greek Anatolia increases with latitude and in peripheral areas, are thus to be linked to the recent migration of southern Balkan populations of R1a1a1b1-Z283 lineages (mainly Slavs, but also Aromanians and Albanians), and to the western spread of Iranian peoples of R1a1a1b2-Z93 lineages (Heraclides et al. 2017). A potentially older invasion of certain R1a1a1b2-Z93 (and possibly R1a1a1b1-Z283) lineages during the Bronze Age could be supported by the finding of this lineage in Srubna-related settlers along the Danube in the first half of the 2nd millennium BC, although it is unlikely that they reached Greece in sizeable numbers (see §viii.11. Thracians and Albanians). On the controversial ethnicity and language of the Sea Peoples (Figure 71) and the closely related Philistine question, archaeological evidence suggests a large scale immigration to southern Canaan from Anatolia and Cyprus in the 13th–11th c. BC, and material culture of Cypriote, Aegean, and especially Mycenaean influence associated with cultural changes during the transition of the Late Bronze to the Iron Age (Woudhuizen 2006; Maeir, Davis, and Hitchcock 2016; Middleton 2015). In particular, Monochrome and foreign Bichrome styles contemporaneous in Canaan reflect social interactions during ca. 100 years, supporting the notion that foreigners arrived to Canaan in more than a single event, supporting a “deep change” in the local material culture, including cultural mixing or creolisation and hybridisation. This influence started in Philistia to the south in the late 13th c. BC, during the time of Ramesses III, and diffused to the north after the retreat of the 20th Egyptian Dynasty (Asscher and Boaretto 2018). The turnover in the southern Levantine pig population to European lineages around this time also support increased mobility from west to east (Meiri et al. 2019). Figure 71. 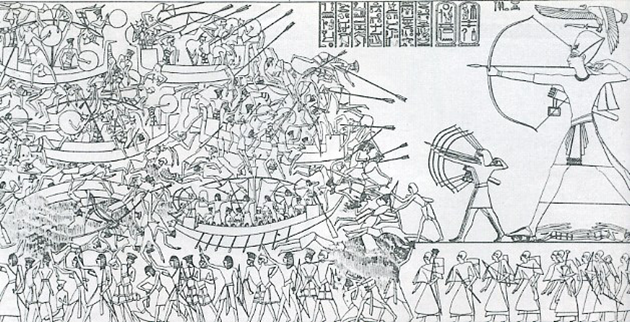 Famous scene from the north wall of Medinet Habu that illustrates the Egyptian campaign against the Sea Peoples in the Battle of the Delta. Egypt's enemies are described simply as being from “northern countries”, but early scholars noted the similarities between the hairstyles and accessories worn by the combatants and other reliefs in which such groups are named. Image from Wikipedia. A Canaanite individual from a clay coffin burial in Tel Shaddud (ca. 1250 BC), reported as of hg. R1b1a1b-M269, has been interpretated as a Canaanite official residing at this site and emulating selected funerary aspects of Egyptian mortuary culture, apparently connected to the administrative centre at Bet Sheʽan during the 19th and 20th Dynasties (van den Brink et al. 2017). This and another contemporary, non-relative individual from a nearby burial pit, of hg. J, show similar estimated ancestry, clustering closely with modern Levantine populations (see §vi.5. ). While the nature of the Egyptian presence in Canaan during the Late Bronze Age is still discussed, the presence of a typically Indo-European lineage in the Levant during the LBA would further support the potential association of Sea Peoples with the Aegean in general, and with Greek speakers in particular. Genetic research points to a mixture of Steppe ancestry found in the Lebanese population that occurred ca. 1740–160 BC (Haber et al. 2017). Steppe ancestry is found in Roman Period individuals, but not in Bronze Age individuals, which supports its introduction more than 2,000 years ago (Haber et al. 2018). R1b1a1b1b-Z2103 lineages appearing in the region after the Bronze Age are probably of Balkan origin (Greeks or Armenians), while R1a1a1b2-Z93 lineages are of Indo-Aryan or Iranian origin, although R1b1a1b1b-Z2103 could have also been associated with Indo-Iranians and early Iranians.